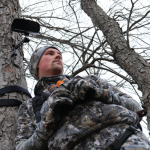 Using a safety harness and having safety ropes on your deer hunting tree stands simply makes sense. After all, a fall from 10 or 15 feet could lead to serious injury. Writing in Bowhunting World, Dave Maas admits he doesn’t always use a harness, since it isn’t always convenient for him. That said, he says he is focusing more and more on safety in his hunts, having heard too many stories about hunters who’ve have tree stand spills with disastrous consequences. Maas says he has been extremely lucky, since he’s never fallen out of a tree even though he’s been hunting for more than 40 years. But he remembers several scary moments when faulty tree steps have snapped under his boots. Thankfully, he was holding on to other steps when that happened. Don’t climb with your bow; use a hauling rope to bring the bow up to you. If tree steps or ladders are slippery, or if the wind’s blowing more than 25 mph, hunt from the ground. And keep your cell phone close by, in case you have an accident. As deer seasons open around the country, PotlatchDeltic urges hunters to take the time to make sure they are following best practices, whether it’s by following gun safety rules or ensuring that tree stands are secure. We are proud to sell quality hunting land around the nation, knowing that getting outdoors can create memories that last a lifetime. This entry was posted in Hunting, PotlatchDeltic and tagged #PotlatchDelticLand, Bowhunting, Fall Hunting Prep, Hunting Safety Tips, Treestand, Treestand Safety. Bookmark the permalink. ← Fall into our Property Showcase!